Having a puppy can be extremely challenging yet rewarding. They require so much attention and dedication to train them, yet at the same time they give so much love. My pup, Rowan, is officially a year old now and it’s been a very busy year! He’s so much more than our dog, he’s a true part of our family that we all love. However, training has been our biggest challenge. 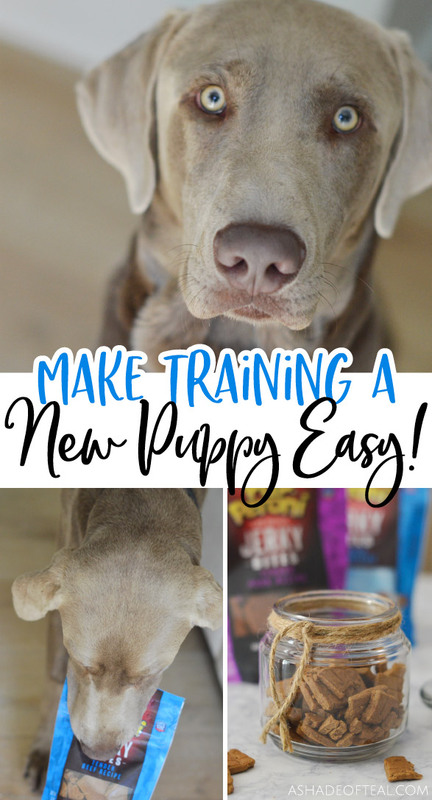 Luckily, I have some simple tips to help make Training a New Puppy Easy! I’m no expert when it comes to dog training, but now, on my 4th dog, I have been exposed to several different training types and I have learned a couple things that work. These are some simple tips every pet owner should attempt to follow when they are Training a New Puppy. First, find treats they love. If they have to work for something they really want then they’ll do just that. 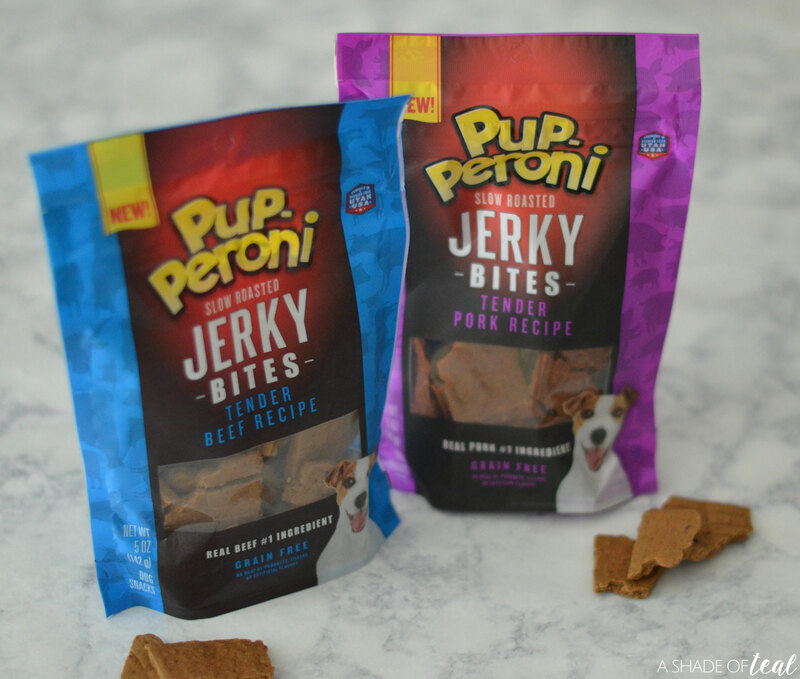 My pup loves the NEW Pup-Peroni® Jerky Bites that I purchased at Walmart. They come in a Pork or Beef flavor, and of course he loves both! They combine the real pork (or beef) indulgence dogs love about Pup-Peroni with the premium ingredients pet parents want. Both are made with either real pork or beef as the number-one ingredient. That means no grain, meat by-products, fillers, or artificial flavors included. The tender mouthwatering dog snacks are easy for dogs to chew plus they work great for training since you can easily break them into small pieces. 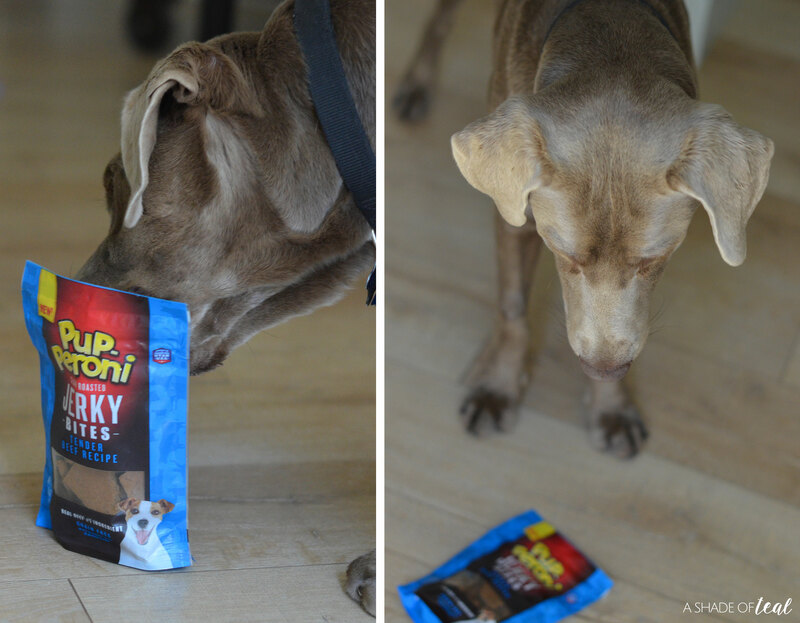 I’ve attempted several different types of treats, but for some reason our pup reacts to soft chewy treats. 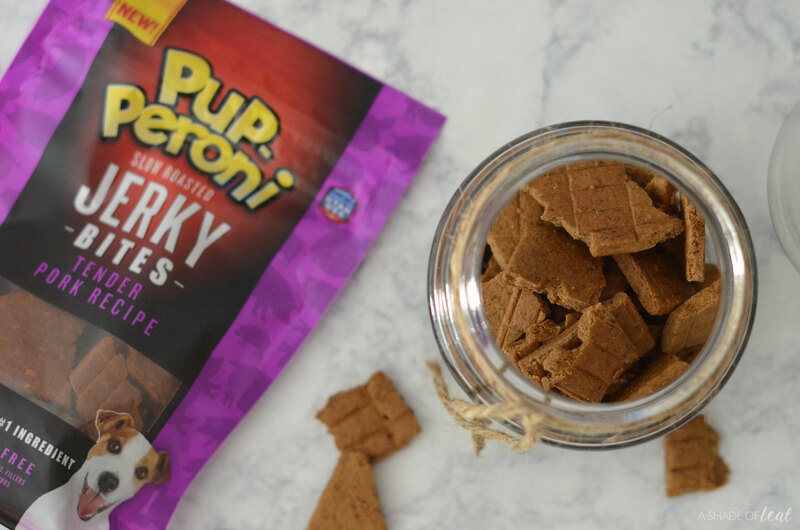 You can also give Pup-Peroni Jerky Bites to dogs as a snack or treat as part of a healthy diet. Second, make sure you’re always rewarding positive behavior. I know I struggle with this since sometimes things get busy and you don’t realize you missed a great opportunity to give your pup praise. One thing that has helped is adding a treat jar. I try to keep it stocked and on my counter at all times, that way his favorite snack is always a quick grab away. What’s funny, is, he’ll do something positive and I don’t catch it yet he still nudges me to the treat jar. I don’t even have to ask him to sit anymore, he knows that’s the #1 thing I request. Finally, be consistent. It sounds so easy yet we all know how hard it is to stick to something. When teaching your pup to sit or stay, using the same cues every time really helps. Being consistent can also become challenging if you and your spouse do things differently. It took some time, but I realized one day he was not listening to cues like “down”. I would use the word “down” for him to lay down and my husband was using “down” as a “off” command. It sounds silly, but our pup was not getting it. Now we both are on the same page and he’s following through on “off” versus “down”! 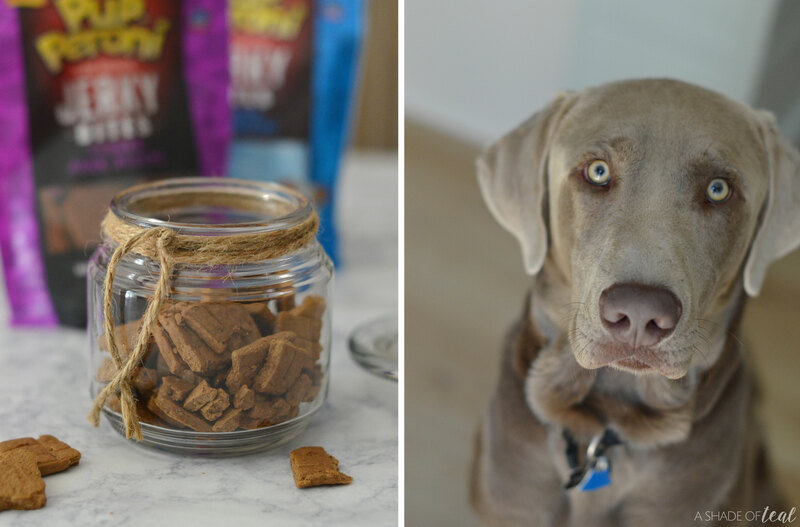 Puppy training is no easy feat, and our pup is a constant work in progress, but working with his favorite treat has been a huge help. He’s all about the tender jerky bites with big meaty flavor! 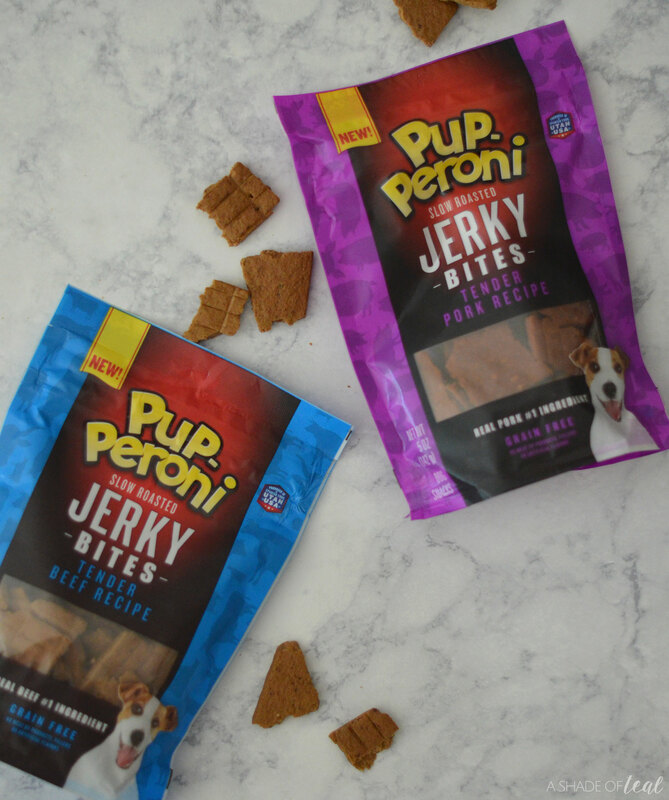 The Pup-Peroni Jerky Bites are available at Walmart in the Dog Snacks aisle. Make sure you get the Ibotta offer below and go grab a couple bags and start making training easy!